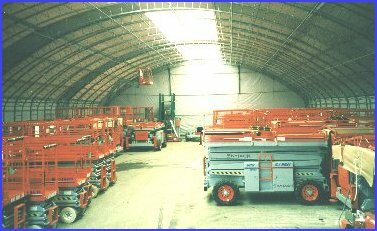 Inside view of this warehouse unit shows the truss style design and natural light allowed in via a full length skylight. The size of this DomeShelter™ model is 60 ft. x 23 ft. x 140 ft. The size of this DomeShelter™ is 36 ft. x 17 ft. x 36 ft.